A day after its employees voted in favor of a strike, the city of Sunnyvale filed an injunction to prevent the disruption of city services related to public health and safety, city officials said. Union employees for the city voted Tuesday to go on strike after the city asked union leaders to return to the bargaining table, which they left last year, city officials said. Employees represented by the Sunnyvale Employees Association have been working without an agreement since the last Memorandum of Understanding expired in 2015. 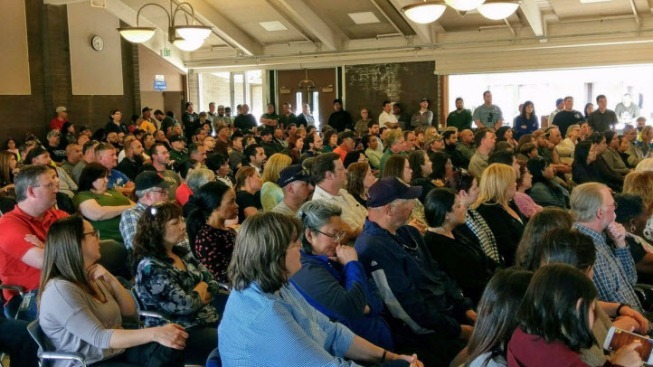 In June, the Sunnyvale Employees Association rejected the city's "last, best and final offer," including a 10 percent wage hike over the next 15 months and the continuation of a 30 percent employee pension contribution. But SEA has demanded a 14 percent wage hike, including retroactive wage increases that the city budgeted for but is now refusing to pay, according to third-party fact-finder Barry Winograd, who was chosen by the city and the union to mediate the dispute. "Our members have gone over five years without a net wage increase," SEA president John Simontacchi said in a statement. "At the same time, the cost to rent or own a home in Silicon Valley has exploded, forcing our members, in some cases, to drive over three hours a day just to be able to support their family." Those wage hikes are slightly less than the city's cost of living, Winograd noted, recommending that the city pay for the retroactive increase. Union members currently average more than $124,000 in wages and benefits, which places them at or above average compared with similar workers in the area. The union represents about 485 of the city's more than 900 employees in both blue-collar and white-collar positions, including planners, engineers, maintenance workers for parks and public works, water pollution control operators, mechanics, clerks, accountants and other technicians. With the injunction, the city asked the court to require water pollution control plant operators, environmental chemists responsible for maintaining water quality, water and sewer plant crew leaders, landfill technicians, public safety records specialists and fire department fleet mechanics to remain on the job. "It's regretful that SEA has put the city in the position of having to go to court to make certain that essential employees don't walk off the job and put public health and safety in jeopardy," Sunnyvale Mayor Glenn Hendricks said in a statement. "The city has a fair and reasonable offer on the table that balances fiscal responsibility and competitive wages, in the face of just absorbing $300 million in new CalPERS (California Public Employees' Retirement System) costs," Hendricks said.